European Politics 3 Edition This popular and highly praised text provides a lively and accessible introduction to the governance and politics of Europe.Thematically structured to address the key institutions and issues, it is genuinely pan-European in scope. 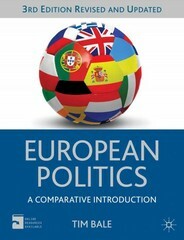 Although no country is ignored, a range of representative countries (the Czech Republic, France, Germany, Italy, the Netherlands, Poland, Spain, Sweden and the UK) as well as the European Union itself, are used as key examples throughout the book and each of them is the subject of an in-depth double-page country profiles. The text is supported by a range of features, including:- Double-page country profiles with coverage of key issues- Debate boxes which give the pros and cons of contested issues- Key Point boxes to reinforce learning and aid revision- Further Reading, Web Links and Discussion Questions for each chapterThe third edition has been fully revised and updated to take account of the latest developments and now includes coverage of the Eurozone crisis, governments' austerity measures and recent legislation affecting privacy and human rights.